Token Creek – Home of the Biggest Little July 4th Parade! Token Creek is an unincorporated community that is part of the village of Windsor. The town of Burke also has some sections here as well. We are going explore Token Creek, past and present. We had the pleasure of celebrating July 4th here in 2017, so much fun! They distill July 4th to the basics, honoring all veterans , joining family and community together for a day of fun. A favorite tradition is holding hands and singing along to Lee Greenwood’s famous song, God Bless the USA. They call it the “Circle of Freedom”. See it here. Token Creek also has many businesses on Portage Road and Highway 19. A popular restaurant is on the corner of Hwy 19 and Portage Rd is the Paddle Inn. 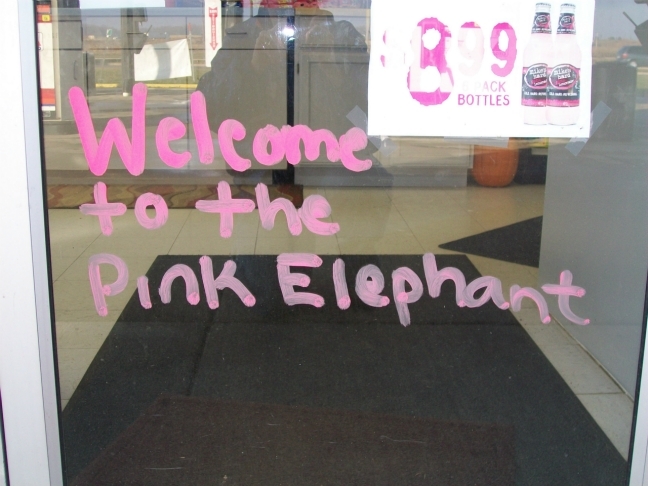 We need to eat there sometime. Turn right at the corner and you find several more. Gentle Breezes Hot Air Balloons has been giving you a ride to remember since 1990. Before that there was a different balloon company here called Token Creek Balloons, different ownership. At one time, the water tower near our home was painted with their logo. It now is blue and says “DeForest”. Juke Box Bandstand provided great music at the Token Creek July 4th celebration. DJ Marc Lovicott did a great job keeping the crowd dancing as well as staging the entertainment and parade. If we needed a DJ service, I would choose them! Store your stuff at Token Storage. Take care of your pet at Token Creek Veterinary Clinic. Back on Portage Rd, visit The Keg. Next is the parks, Token Creek cares about the wildlife in the are and makes sure they have a place here too. Token Creek itself is still a work in progress. Across 19 from Portage road is a sign about that. Continue down the road and you will get to the Token Creek Conservancy, where the old grist mill used to be. At this pond behind the sign, only the disabled are allowed to fish here. Just beyond this sign is the Token Creek marker you see at the top of the page. A little past here is more of the park and the cemetery where the Veteran’s Remembrance Ceremony was held on July 4th. First the bridge over the creek. The mill used to be in this area, now a beautiful park. To the left of the parking lot is the cemetery. Keep walking streight ahead through the parking lot and you will soon come upon a bridge over the creek. Also a plaque on a rock to the right of the bridge. A man was fly fishing on this beautiful fall day. A view of the cemetery. Our last stop today will be Token Creek County Park. Here you will find the other marker in Token Creek, near the park entrance. You can camp here too. Enjoy the pine forest with many mature trees. I enjoyed my visits to Token Creek. To learn more about the community in the 19th and 20th centuries, I have a copy of this book, Token Creek by Mae Bork. The book is now out of print, but I found a copy here if you are interested. This is the first year Windsor has an official holiday light display. DeForest had their first display in 2015. They all start out small, then grow over time. It looked quite beautiful after the 7.9 inch snowfall that occurred the previous day. The trees lights changed from white to multicolored. Here is a video of the lights. Closeup’s of the individual displays between the trees. Be sure to patronize these fine businesses and thank them for being a light sponsor. 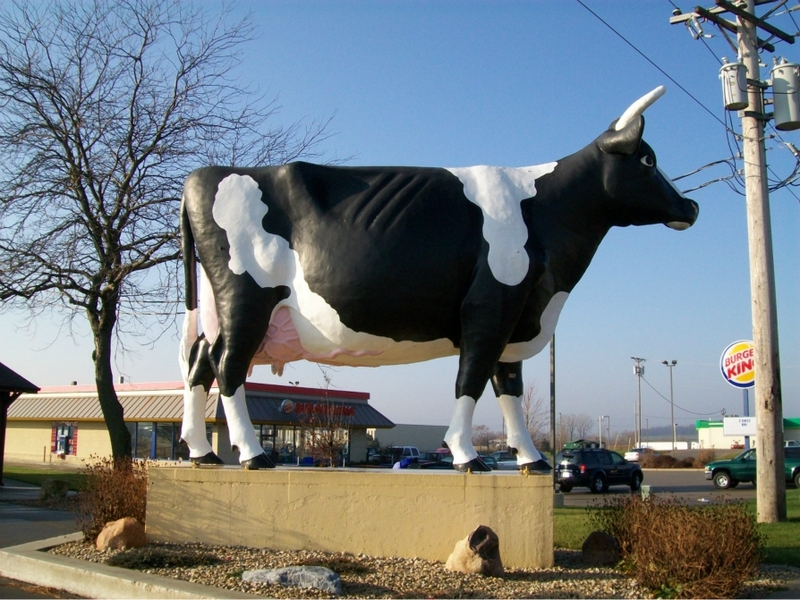 Pink Elephant and a Large Cow In DeForest! 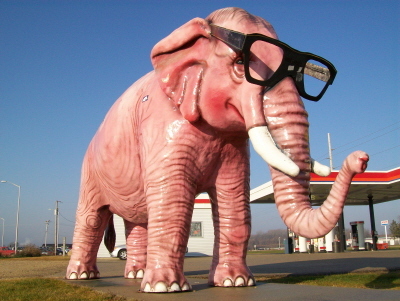 Continuing the big animal theme, there is a large pink elephant at a Citgo gas station in the nearby town of DeForest. 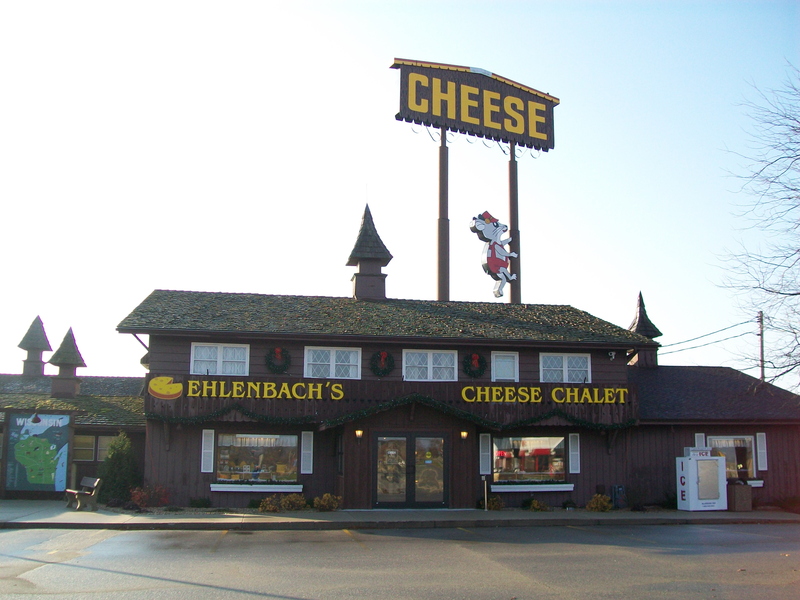 Across the overpass is Ehlenbach’s Cheese Chalet with a large cow named Sissy..
Sissy the Cow at Ehlenbach’s. Not too far away is the Mousehouse Cheesehaus. Igor the mouse holds a big wedge of cheese on the roof.